Booths White Chardonnay – Made from chardonnay grapes grown in the Maconnais region in the south of Burgundy. The extra warmth and sunlight gives more richness and ripe fruit character than Burgundies made further north. This fruity wine has aromas of peaches and nectarines, with rich and creamy ripe fruit flavours balanced by a fresh and vibrant finish. Great on its own or paired with with roast chicken and meatier fish such as monkfish or cod. 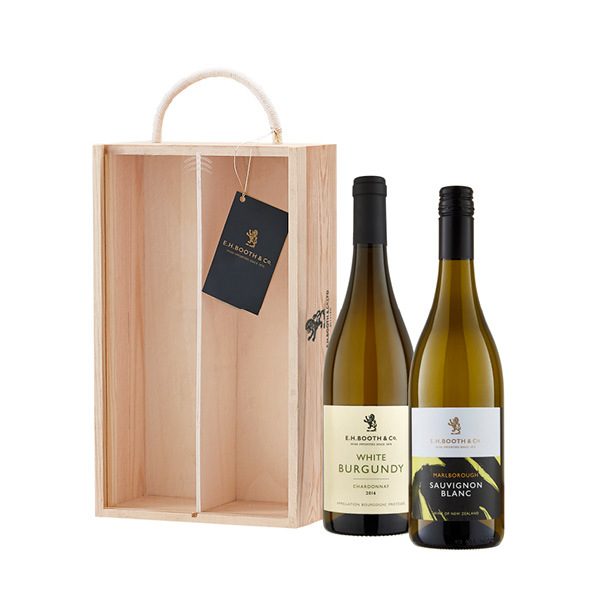 Marlborough Sauvignon Blanc – Sourced from a spectacular corner of Marlborough, directly on the coast of the South Island of New Zealand, these vineyards are exposed to extreme coastal weather conditions and diverse soil types. The rolling terrain and maritime influences result in wines with intense varietal characters, brimming with pure fruit flavours. Shows ripe notes of passionfruit and guava, underpinned with aromas of fresh herbs. The palate is bursting with zesty, pure fruit flavour that is balanced with a long, crisp mineral finish. Perfect on it’s own or enjoy with both fresh and cooked seafood.